Over one thousand American citizens managed to invade Canada at the weekend, opting to do so with a water based assault on territory belonging to their neighbours to the north. But Canada should probably resist the urge to go full Trump and demand the erection of a great wall to keep illegal U.S. immigrants out – at America’s expense, of course – as it was all just one drunken mishap. 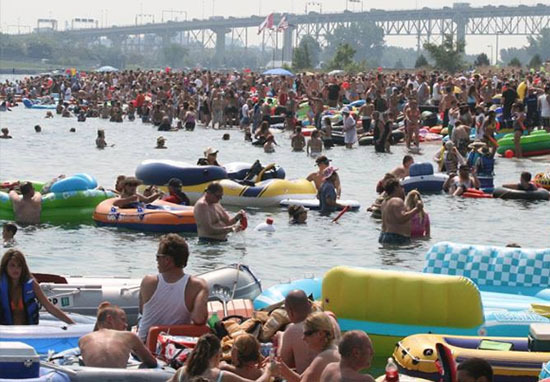 Every year, revellers from the States jump into rafts of varying description and float down the St. Clair River, Michigan for a day of drinking in the sunshine. This year, however, the weather was so bad that hundreds were blown way off course, crossing international borders and entering Sarnia, Ontario. As reported by BuzzFeed, it provided quite the logistical nightmare for Canadian authorities who needed to round up the accidental invaders. Some ‘floaters’ were apparently so concerned with straying into a different country they tried to abandon ship and swim home. They were terrified of coming to Canada without a passport. Those were the people we had our eye on, because they were just jumping in and saying, ‘I’m swimming back home. There were reports of minor injuries, but the intervention of the Coast Guard to assure people they could go ashore will no doubt have helped take control of a dangerous situation. The organisers of the event have since taken to social media to express their gratitude for Canada for being such a bloody hospitable nation. We want to express our gratitude to the Canadian Authorities for their assistance and understanding with the floaters who’ve unintentionally been forced to the Canadian shoreline. You’ve shown us true kindness and what it means to be amazing neighbors!